As many of our iOS app and multitouch tablet users already know, smart phones and tablets are becoming a viable and impressive new way of creating art. This emerging art form is being explored and showcased by mDAC, hosted by the Mobile Art Academy in partnership with the Pacific Art League, and partly sponsored by ArtRage. 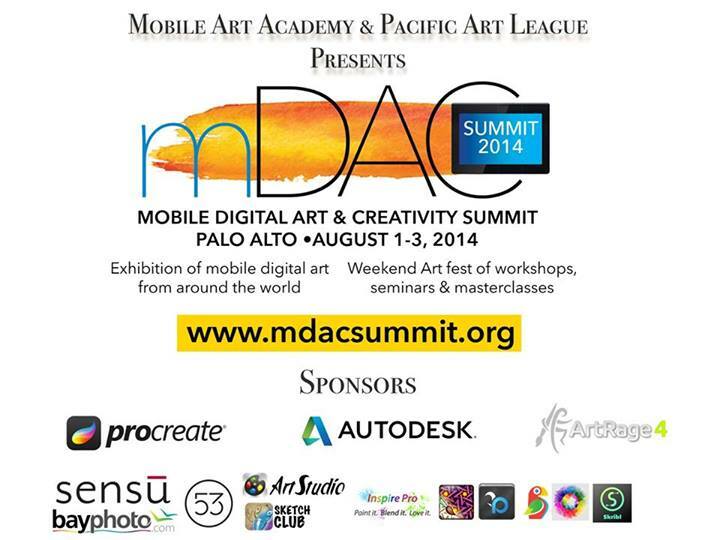 The 2nd Annual Mobile Digital Art Exhibition will open on August 1st in San Francisco and run for three days. It will be a major event that includes a busy timetable of art workshops and seminars along with the art gallery itself. The exhibition will feature over a hundred pieces submitted by artists around the world, to demonstrate the artistic potential of mobile devices including iPhones, iPads, Androids and Surface tablets. Interested in trying ArtRage on a mobile device? If you would like to try your hand at a bit of tablet painting, then check out our different ArtRage editions to see which one suits you best. You can purchase the iPad or iPhone apps through the iTunes App Store. You can install the desktop editions onto the Surface Pro, Cintiq, or similar tablets that run Windows.